Ease the communication between you and your customers and never miss potential leads anymore. 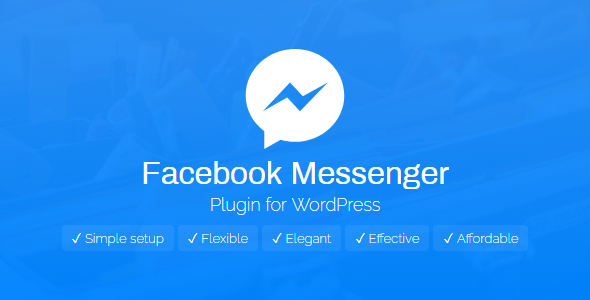 Facebook Messenger plugin for WordPress displays a widget of your Facebook fan page which can be used by your customers as an instant messaging right there on your site. With its default configuration, the plugin works out of the box once it’s installed. You just have to give it your Facebook fan page URL and the widget will be there on your site. Customize your widget to match your site’s theme. Make it personal and let your customers understand that the widget is actually an integral part of your site. If your customers use wide screens, a tiny round toggle sitting at the corner of your page will have a hard time getting itself noticed. Draw your users’ attentions onto the widget by setting an auto-display for it to tease them. Auto-display can be set based on time-delay, inactivity, or scroll-length. Auto display can be disabled on devices with small screen. In fact, you can hide the toggle entirely or only when the page is being scrolled down. We don’t want to ruin your customer’s browsing experience now do we? Do you want to show the widget on the whole site or only on your product pages? This plugin will list all the custom post types installed on your site and all you have to do is checking the ones where you want to show the widget. You can put a Facebook Messenger button on your product pages right before or after the “Add to cart button”. Using Facebook Messenger as a support channel is effective and affordable. Get one for yourself!